In four years Stormzy’s catapulted from being one of the most promising grime artists of his generation to a full-on spokesperson. Rise Up is the story of how he got there: a tale of faith and the ideas worth fighting for, about knowing where you’re from, and where you’re going. It’s about following your dreams without compromising who you are. And it’ll no doubt be a #Merky tale. Featuring never-before-seen photographs, lyrics and contributions from those closest to him, Rise Up is the record of a journey unlike any other. Stormzy says of his debut book: “When I was in school I fell in love with literature and looking back it’s safe to say that this was the start of a life-long journey with words, poetry and writing. I read books religiously and often wrote poems which were undeniably setting me up for a career as a songwriter and a rapper. "We’ve created #Merky Books for many reasons, the first simply for it to be a reference point for talented young writers to say 'I can be an author' and for that to be a feasible and realistic achievement and not something in the distance. 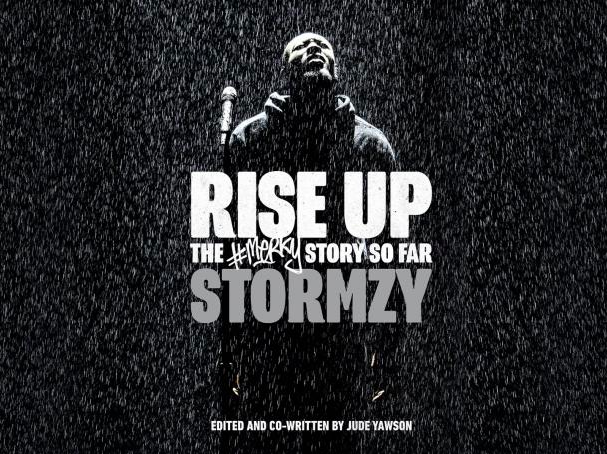 In addition, Rise Up and #Merky Books launches with a world premiere event next week, featuring Stormzy in conversation with Akala, alongside special guests Malorie Blackman, Benjamin Zephaniah, Chelsea Kwakye, Ọrẹ Ogunbiyi and Jude Yawson, at the Barbican in London on 7th November. It will include performances by poets Caleb Femi and Bridget Minamore in a spoken word showcase curated by Stormzy and Apples and Snakes.